Everton have completed the signing of Darron Gibson from Manchester United on a four-and-a-half year deal for an undisclosed fee. 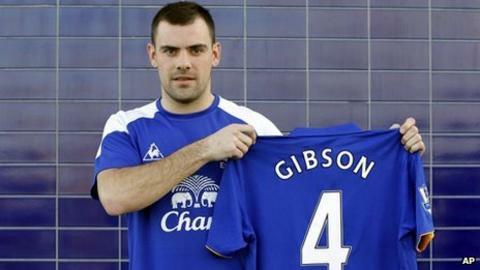 Gibson, 24, has moved to Everton to become the club's second signing of the January transfer window. The Republic of Ireland midfielder said: "I am looking foward to the challenge and it was the right time for me to move on from Manchester United. "Hopefully I can improve Everton, it's a great club with great fans." Gibson has a reputation for scoring spectacular goals, netting 10 times in 60 appearances for United. "I think I'm a goalscoring midfielder and hopefully I can get a few goals," he added. "I've scored a few long-range shots - I don't think I've scored one inside the box to be honest - and if I score goals it's a bonus for me. "I'm just looking to do as well as I can for the team." Gibson, a product of the United youth team, was born in Northern Ireland but opted to play for the Republic and has won 17 caps. A proposed summer move to Sunderland broke down over personal terms, and he was down the pecking order at United. He is the Toffees' second signing this month after they brought Landon Donovan back to Goodison Park from LA Galaxy for a short loan spell. Boss David Moyes had also been hoping to sign a striker, but may now need to pay more attention to central defence, with England international Phil Jagielka out for six weeks with a knee injury and Sylvain Distin suffering a hamstring injury in the 2-0 defeat by Tottenham at White Hart Lane. Gibson's former manager, Sir Alex Ferguson, is backing the Irishman to do well at Goodison Park. "I think it's a good move for him," said Ferguson. "He's got terrific ability, Darron, but he knew he wasn't going to be a first-team regular here all the time. "He played some terrific games for us but unfortunately he got an injury in the early part of the season that kept him out for 10 weeks but he's fit again and it's a good opportunity for him."